Twelve down, many to go – Whisky Squad has almost reached its first birthday and to mark the occasion we had a rather special evening nestled in the hands of Chris Maybin from Compass Box. I’ve mumbled out Compass Box in the past and they remain one of my favourite whisky companies, with consistently interesting and tasty products as well as a really friendly team working to put them together. I met Chris briefly at Whisky Live London in 2010, when I went to the Compass Box stand for a second time at the end of the show and he insisted on making me taste everything they had for a second time…what an evil man. The company has just had its 10th anniversary, starting out in 2000 with former Johnnie Walker marketing director John Glaser putting together his first whisky and selling some cases of it to Royal Mile Whiskies in Edinburgh (if I remember the story correctly). Ten years on they’ve created a variety of interesting blended whiskies (as well as a few very limited single cask bottlings), won a stack of awards and stuck out as an innovator in the generally conservative world of blended whisky. They take the opposite tack to most blending companies, focusing on producing whiskies where you can taste the various components, and how they compliment each other, rather than a more amorphous combined flavour. This is in part achieved by using a smaller number of component whiskies (typically three) as well as doing the blending in smaller batches a number of times a year, creating whiskies that vary slightly from batch to batch but always keeping the same idea behind the flavour. From the tasting I did with John Glaser last year I know he is not a fan of spirit caramel, used to colour many whiskies for a variety of reasons good and ill, and Chris agreed, passing around a bottle for us to have a sniff. I rather liked it, burnt sugar that it is, but am not a fan of it in whisky. While I understand the usual use for colouring whiskies, so that they are consistent between batches, and don’t think it has as much of an influence on flavour as many say, it does mask flavours and alter the mouthfeel of a whisky when used in larger quantities, and isn’t something that I think should be needed if consumers understood their drinks more. However, most people aren’t whisky geeks and don’t care so the colouring continues. Compass Box also don’t chill filter their whiskies, a process that definitely has an impact on the flavour and mouthfeel of whisky, leaving their bottlings as close to ‘natural’ as you can have without leaving chunks of charred barrel in the bottle (cf Blackadder whiskies…). 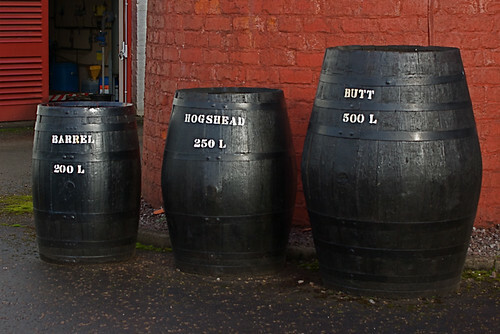 Their production process is quite simple for their regular range – buy maturing casks of spirit, test them until they get to the point where they are ready to be used, make small test batches of blended whisky in their Chiswick office, send the finalised recipe up to Scotland where the whiskies are vatted together, recask the whiskies after blending, leave them to marry and further mature, bottle. The marrying process takes at least 6 months, but they leave some whiskies longer depending on what they are trying to do with them. The choice of wood for that final maturation stage is very important, with their experimentation in the area getting them into trouble with the SWA (as John Glaser explained in a comment when I wrote about it before), but I’ll talk about that a bit more later on. On with the whisky! 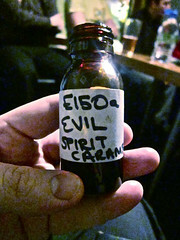 As usual we tasted blind, with each bottle being revealed after tasting, and first up was a lightly coloured dram. This was my first correct guess of the evening, although my cheating by looking up its recipe in an earlier blog post fell down due this batch having different components. The nose had stacks of vanilla, backed up with some lightly sweet wood smoke, coconut, sweet butter, apples, pears, marzipan and a hint of cherry – cherry bakewells in a fruit bowl? To taste it started with sweet citrus (candied lemons?) and worked its way through sour wood and fruit salad chews to a dry wood and spice finish, with a bit of a boozy prickle. Water brought out big sweet caramel (rather than the evil burnt caramel) and left a nice chunk of woodiness at the end. 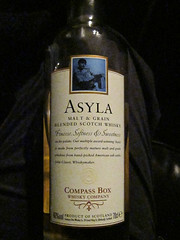 This was, as expected for the first dram of the tasting, Asyla, the closest that Compass Box have to a ‘regular’ blend and a great entry point to their range. It’s 50/50 grain and malt whisky, with the grain half coming this time from Cameron Bridge (for sweetness), and the malt from Teaninich (for grassiness) and Glen Elgin (for rich robustness). All the whisky is matured in first fill bourbon casks and after vatting is put back into those casks to marry for 6 months before bottling. The name isn’t the bad pun on Islay that many people think it is, myself included, but instead the plural of ‘asylum’ (a word meaning both sanctuary and madhouse) and taken from the name of a piece of music by Thomas Adès. They make about three batches of Asyla each year, with tweaks to the recipe to keep it in the same area of flavour based on what whiskies they have available, and are planning on numbering the batches soon. Chris mentioned that the SWA, traditional foils of Compass Box, are planning on regulating the listing of batch numbers and blending constituents, but I can’t find any information on that – anyone know anything? It wouldn’t surprise me, although in recent times I’m coming around to not disliking the SWA as much as the initial stories I heard about them, from Bruichladdich and Compass Box, encouraged me to. Next up was the beginning of my no longer having any idea of what the whisky was, despite having tasted most of them before. On the nose there was whiteboard marker sweetness, foam and real bananas, vanilla and a hint of woody smokiness. The taste was bigger and richer than the Asyla, with more fruit salads, astringent wood, hints of marzipan, thick sweet woody spice and a thicker, slightly oily mouthfeel. Water brought out more of the fruit chew-ness and more prickly wood along with some sweetened cream and liquorice. The paper came off to reveal that this was Oak Cross, the first of a trio of whiskies that vary mainly in the wood used for maturation. It’s made up of mainly Clynelish (about 60%) with the rest split between Teaninich (for the grassy freshness) and Dailuaine (for structure). After vatting this whisky is filled half back into the original first fill bourbon casks and half into special Oak Cross barrels – first fill bourbon casks with the regular heads (the barrel ends) replaced by new French oak, not touched by other drinks and lightly toasted. New French oak is used a lot in the wine industry but not really touched by whisky as the nature of the spirit quickly draws lots of tannins from the wood, making whiskies dry and woody before their time. However by only using new oak heads during the 6 month marrying process the whisky can pick up some of the French oak characteristics without going too far. In a way this technique can be seen as retaliation for the SWA’s reaction to the next whisky. This one was one of my favourites of the night, with vanilla, candied lemon, some floralness, raisins and wood on the nose – ‘Crepe Suzette’ according to whisky wordsmith Mr Matchett. To taste it had spicy apple, creamy custard, raisins, hints of chocolate, big woody spices and a woody end. Water brought out more wood and fruit, as well as some sourness. When the label came off I was pleased to see that this was one I’d not tried before, having no clue what it was – Illegal Spice Tree. 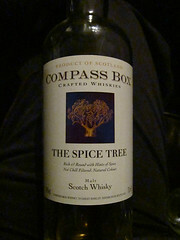 The illegal bit isn’t quite right, but it was Compass Box’s first edition of Spice Tree, which the SWA told them they weren’t allowed to sell, under threat of legal action, due to the wood maturation process. Taking the same recipe that is now used for Oak Cross they filled some of the vatted whisky into first fill bourbon casks that had new heavily toasted French oak barrel staves tethered to the inside, giving the whisky contact with a lot of wood, including a big surface area of the new oak. However, the SWA felt that this was not a traditional enough maturation method to allow the product to be called whisky and thus was it withdrawn from sale in 2006. This was from Jason’s personal stash and one that only occasionally appears in the wild these days. 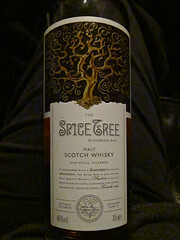 Next up was the third in bottle in the Spice Tree saga and one that most of us guessed even before pouring would be the newer, legal version of Spice Tree. On the nose this reminded me heavily of Fry’s Orange Cream bars, with an underlying spicy earthiness. To taste it had sweet polished wood leading to a lingering, warm, woody finish. On the way there there was lightly burned toast, a sherbety fizz, dark caramelised oranges and coffee. Water brought out dark chocolate in the nose, some floral notes (violets? I need to find some violets to smell to see if the scent I think is violets really is…) and Turkish delight. A more elegant whisky than the older Spice Tree but one that I didn’t like as much, although that could well be a subconscious love of that which I can no longer easily obtain oozing out. This whisky is very similar to the Oak Cross in nature, but with the 6 months of maturation in the new oak headed casks extended to 2-3 years, the new oak heads undergoing a heavier toasting, 60% of the whisky coming from the special casks and the bottling strength upped by 3% to 46%. It’s made a bit of a stir, appearing on a number of 2010 best of lists including getting the Best New Whisky award in Jim Murray’s 2011 Whisky Bible. We moved on to a whisky that everyone who knew the Compass Box range immediately guessed after a quick sniff – stony peat, coal smoke, smoked meat and a hint of iodine medicinalness. To taste it was sweet, with a creamy slightly cheesy note, ending with coal smoke and a blue cheese sweetness (the latter note one that others told me, as I don’t touch the evil, mouldy stuff). Water brought out soft, mulchy fruit in the middle, more fruit in the upfront sweetness, and left the finish intact – like breathing in while standing next to a coal burning stove. 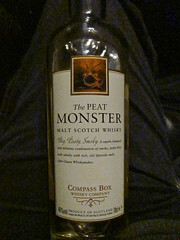 It was, of course, The Peat Monster. Much less peaty than the name suggests, a whisky that shows that peat and smoke in a whisky don’t need to be overpowering. This is made up of a combination of 20% Laphroaig, 40% Caol Ila and 40% Ardmore, the only mainland highland distillery doing exclusively heavily peated spirit, and comes in at 25ppm. The Laphroaig and Caol Ila really come through on the nose, with the minerality and medicinal punch, but in the taste they are overcome by the more rounded smoke of the Ardmore – an excellent combination. 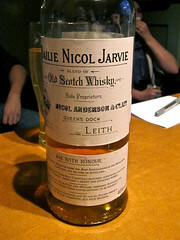 This one was originally put together for Park Avenue Liquor in New York, as The Monster, and was a chunk peatier, but after some softening it joined the regular range with a different name, even if that name does confuse people who are looking for something to strip away the inside of their faces with a peaty punch. 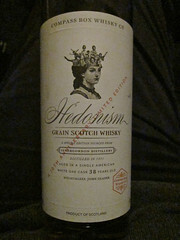 Next was a whisky that I knew very well from just the nose – Hedonism. This is the whisky that I wrote about in my first entry on this blog and one that I still vary from day to day whether I love or hate it, although my increasing love of nicely aged grain whisky has hacked away at the days when it’s not one of my favourites. Fortunately it was a day when I really liked it. On the nose it had sweet candied fruit, vanilla, acetone, buttery pastry, rum, garibaldi biscuits, coconut, tropical fruit and banoffee pie. To taste it was sweet and floral, with high alcohols and ripe tropical fruit. Water dropped out some of the sweetness, replacing it with woodiness, and added more prickle, more body and some creamy vanilla. 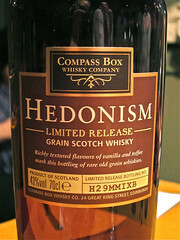 This was Compass Box’s first whisky, starting with a product unlike others on the market – A blended grain whisky. They do a couple of batches a year and this one (H29MMIXB – 29th batch, second batch of 2009, the one after the bottle I have) is a blend of 14 and 29 year old from Cameron Bridge, Cambus (now closed) or Carsebridge, with a little drop of 30 year old Invergordon (not usually added, but in this batch for a little more richness). This one is a more limited release than the others in the range in part due to the niche nature of grain whisky but also due to the difficulty in sourcing good quality older grain whisky, as most is decanted young and used in blending. The last whisky was the wildcard. 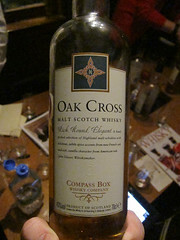 For their 10th anniversary Compass Box had bottled a number of interesting whiskies and having tasted through the rest of their core range it seemed likely that one of those would appear as whisky number 7. On the nose there was acetone, vanilla, cherries, flowers (maybe violets?) and icing sugar – combining to give “Cherry bakewells with superglue icing” (thankyou Mr Matchett) and “Manhattan cocktails”. To taste it was less sweet than the nose suggested and like a rich dessert wine with concentrated grapes, a burst of grassy new make spirit and long lingering sweet fruity finish. Water brought out roses, Turkish delight and glacé cherries. I was quite blown away by this and a bunch of head nodding down my end of the table confirmed what we had hoped, it was Hedonism 10th Anniversary Edition. Different to most of the other Compass Box whiskies (apart from their Canto bottlings, I think) in that it is a single cask whisky. It’s 1971 Invergordon (rumoured to be a sister cask to the now no longer available Berry’s Own Selection bottling which I tried last year and which was also excellent) bottled in 2010 at 38 years old, so a single cask single grain whisky, a type of whisky that doesn’t appear much and one that I have so far almost always enjoyed every time I’ve found it. There were 120 bottles produced from the cask, 24 of which were allocated to the UK market at £200 each and there are a few around still to buy. Despite the price I’m very tempted as it was very good indeed and I was thinking about it still two days later, despite having Whisky Live London in between. Speaking of Whisky Live, which was the day after the tasting, I met up with Whisky Squad organiser Mr Standing at the show and having just visited the Compass Box stand we had our tipsy states taken advantage of by the folk of Connosr and recorded a video about another of the Compass Box limited editions, Flaming Heart, in their Whisky Pod. My only comment on the video is that Niceness is an excellent word. Please do not count the number of uses of the suffix -ness in the text above, I just did and it’s shocking. My fairly drunken tasting notes for the Flaming Heart read: “Nose – Muddy peat, light burning hay, orange peel. Taste – sweet start moving through rich spicy caramel to a smoky fiery end. 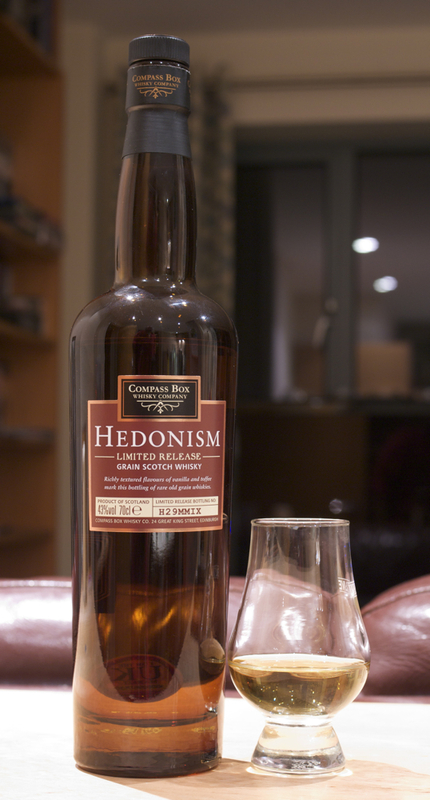 Water – More Clynelish, but with burnt wood over the finish. Fruity middle, mango and pineapple, butter and ash”. Not bad after 5 hours at a whisky show. Whisky Guy Darren very rudely didn’t attend due to having become a dad the day before. I will forgive this terrible breach of etiquette on this occasion and wish him, Mrs Darren and Baby Darren all the best. Blended Scotch Whisky, 40%. ~£25 from Master of Malt. Blended Malt Scotch Whisky, 43%, ~£30 from Master of Malt. 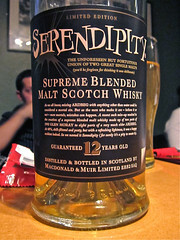 Blended Malt Scotch Whisky, 46%. ~£35 from Master of Malt. Blended Grain Scotch Whisky, 43%. ~£50 from Master of Malt. Being someone who likes to talk I’m jealous of those lucky folks who get paid to wander around and talk about whisky. So, in an effort to get at least part of that I invited an exclusive posse of people around to my flat to have a bit of a whisky tasting. 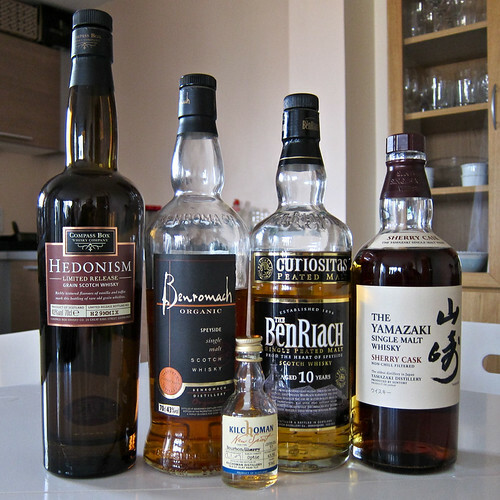 The intention was to try a few things that were in someway different to the norm and to span as much of the whisky spectrum as I could with 4 or 5 bottles. Single Malt Whisky – malt whisky from one distillery. It will be most probably be a mix of various different batches (to get a consistent flavour and style for each line of whisky), but all of the whisky comes from the same distillery. 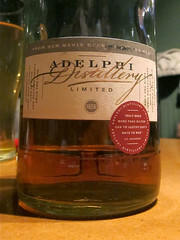 Blended Malt Whisky (formerly known as vatted malt) – changed November 2009, a move not entirely popular amongst many whisky makers. 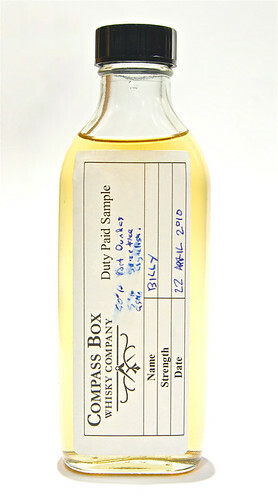 This is a blend of malt whiskies, which can come from any distillery. It is, however, only made up of malt whisky. Blended Whisky – whisky that is made of malt and grain whiskies from any producer. This is a fourth type – a vatted grain (maybe now a blended grain…who knows?). 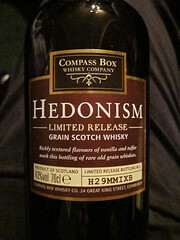 While grain whisky is usually used as a bulking agent for blends, produced quite cheaply in a continuous rather than batch distillation process, there are some producers who take a more malt-like approach to its creation and there are companies who try and do interesting things with it – Compass Box are part of the latter group and buy whiskies from the former. Run by John Glaser (who corrected me last time I wrote about them), they produce interesting blended whiskies that are in a totally different league to the Bells and Teachers of this world. This has some flavours in common with a bourbon, coming from grain as it does, but definitely has a different style. From the audience: It seemed to go down fairly well. It’s the lightest of the whiskies I was presenting, hence its position at the front of the line-up, and even the less keen whisky drinkers appreciated it. Benromach Organic: The distillery reopened in 1996, after years of closure. Rather than the more regular ‘mothballing’ of the site, where they leave everything in place, Benromach was pretty much stripped of all its equipment and had to be almost rebuilt. Their regular whisky is lightly peated (slightly more than the Speyside norm of 0-5ppm of phenols at about 8-12) to try and capture the flavour of speyside whiskies when peat was a more common fuel for drying malt, but the Organic is different. It’s the first Soil Association certified organic whisky and as part of this process everything involved in the making needs to be organic, from malt to barrels. 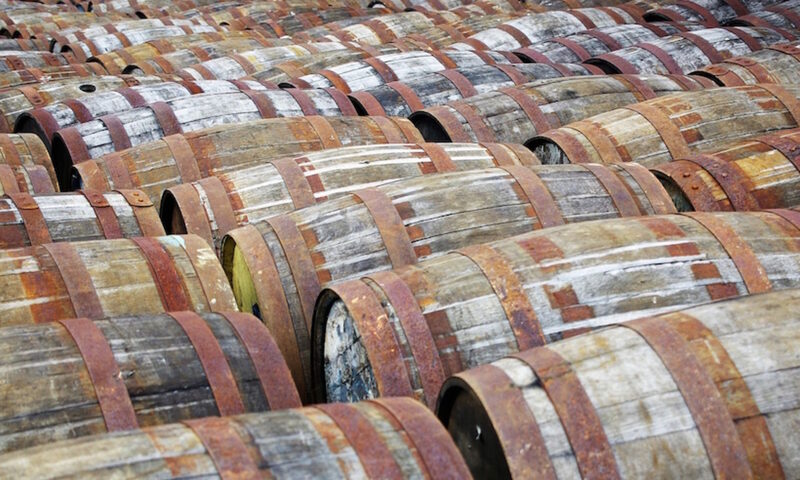 Whisky barrels are normally used before the whisky gets to them – sherry and bourbon are the two main spirits that go in beforehand, and they take on a lot of the woody flavour from the barrel, allowing whiskies to mature without extracting quite as much of those flavours. However, In order to keep with the organic certification the Benromach Organic uses new american oak barrels that have never seen another drop of booze. This whisky is also entirely unpeated, which is fairly normal on Speyside, although their stocks of the regular Organic are running out due to their switching of production to a peated version. I’m not a fan of the new “Special Edition Organic”, so I’m pleased that after a short while they switched back to the unpeated version, so while there will be a gap in availability it will be returning in the future. From the audience: this one started off less popular, with the woodiness not well received. However, with a drop of water the flavour changes a lot, with creamy vanilla appearing, and it grew in popularity. From the audience: I didn’t pour everyone a shot of this – a very young, heavily peated 63.5% spirit is not something that you generally knock back much of – instead pouring a small slug into a large wine glass so that everyone could get at least a smell. Almost everyone tried it in the end, with the reactions being what you’d expect for something that I generally describe as tasting like cattle feed and death. That said, I do quite like the flavour and there were a couple of nods that it wasn’t all that bad, even it was burny and eye watering. BenRiach Curiositas: I’d not heard of the distillery until recently (and I now have a box of miniatures of their aged expressions to try) but heard of the Curiositas through Anna’s twitter stream when her friend Jon got a bottle and rather enjoyed it. The distillery is another that has changed hands a lot, recently being picked up by the independent Benriach Distillery Company (who recently picked up their second distillery – Glendronach) in 2004. It had a sad beginning, opening in 1892 and then mothballed in 1900 when the bottom fell out of the whisky market. It reopened in 1965 under Glenlivet, sold to Seagrams in 1978 and then dropped to a 3 days per week production in 2001, before the more recent purcahse. This is one is different because it’s a peated Speyside whisky. As I mentioned earlier Speyside whiskies are normally peated lightly to not at all, coming in at about 0-5ppm, with Islay whiskies like Laphroaig and Ardbeg being much more famed for their peaty smokiness (with barley peated to about 40ppm and 54ppm respectively). The Curiositas is peated to 55ppm – which is about as peaty as you get for a widely available whisky. They also have a younger version (3-5 years?) of their peated spirit, Birnie Moss, which I found at Whisky Live – it’s mainly sold into the French and Spanish markets, where there is a strangely high demand for young, unmellowed, peaty whisky. From the audience: As expected this one was the least popular, although the speyside sweetness coming through the smoke brought it up the popularity scale quite a lot. The progression from raw spirit to matured whisky worked quite well though, with the mellowing process really showing (although choosing something as powerfully flavoured as the Kilchoman probably helped there). Yamazaki Sherry Cask: The whisky that I ran from Blackfriars to Soho to buy the day before the tasting; one that I tried in Milroy’s at Christmas and rather liked. The difference with this one is that it’s Japanese, which isn’t really all that unusual as there are 90 years of history backing up their produce, and very heavily sherried, which is slightly more so. Whisky production in Japan was started by Shinjiro Torii, a pharmaceutical importer, who founded the company that became Suntory and started bringing foreign booze into Japan. He hired Masataka Taketsuru, who had trained at Hazelburn in Scotland (a name now used by the Springbank distillery to brand their triple distilled, unpeated Campbelltown whisky, as the original distillery has closed), to start distilling at the Yamazaki distillery and Japanese whisky was born. Taketsuru left Suntory in the 1930s, travelled around Japan looking for a spot that felt like Scotland and built a distillery in Yoichi on Japan’s northern island of Hokkaido, starting Nikka, the other famed Japanese distiller. The mix of whiskies that goes into a single malt will often contain at least some spirit matured in sherry casks and other whiskies will be matured for a length of time after they have been married together in a cask which has held sherry or another drink to ‘finish’. However, you don’t get many bottlings which have sat exclusively in a sherry cask for as long as this – a very dark reddy brown whisky, it almost looks like flat Coke and is a bit thicker and stickier than your average dram. From the audience: Far and away the favourite of the night (which is one of the reasons why I did my cross-central-London run the day before to make sure I got some before Milroy’s closed). It’s sweet and rich, with fruitcake and dates. It’s quite unlike the ‘regular’ whisky flavour that people expect, although with enough hiding behind the dried fruit to remind you that you’re not drinking port. I’ve tried an even more heavily sherried Yamazaki at the Scotch Malt Whisky Society, but that almost felt like a fortified dessert wine than a whisky – this is an excellent winter dram, and unfortunately one that seems to be becoming scarce as stocks start to sell out. Alan and Anna have also done write-ups on their blogs and I think I need to give a general thanks to all of my victims for letting me talk at them for an afternoon: Anna, Alan, Ruth, Paul, Nikki and Michael. 40%, 10 years old. Peated to ~45ppm.